It's right next to my EEG machine - one of the original prototypes designed by a doctor in Pasadena, CA - it was in his office after he passed away, and the family allowed me to go through to get anything I wanted out of the house - this is my favorite thing - it's super interesting - although I'd NEVER plug it in (I think I actually cut the plug off) and I have no idea how it works - all I know is that it was used to measure brainwave activity, and that the cabinet is a beautiful wood and I love it. 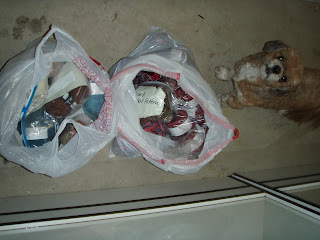 In the garage... 2 more garbage bags FULL of yarn - some of this has been divided by type of project - but most of it is just piled together - and that's Dakota - she's wondering what I'm up to - flopping yarn bags all over the place, snapping photos. 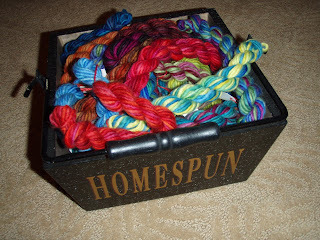 Another bin full of yarn - waiting for assignments. 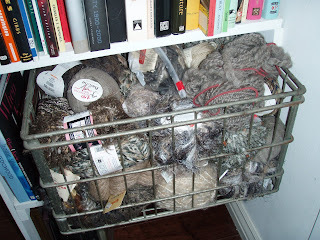 Maybe this weekend I'll work on getting my yarn in order - wouldn't that be nice! 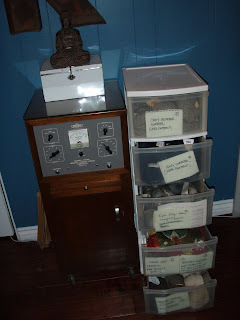 :) I have to get organized so that I slow down on the purchases and figure out what I'm going to do with what I have! 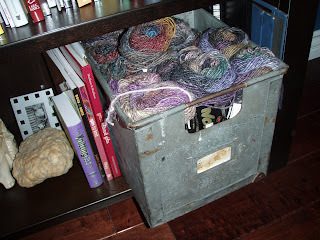 This is my Noro stash - it's for my mitered blanket - this bin is stuffed 2 skeins high - lots of yarn but at least it's spoken for! oh look... more yarn - orphan skeins from the abandoned circle scarf project - it needs to be put somewhere, or reassigned - man - I do need to get my knitting stuff organized! these are just samples from woolmeise - I have yet to order any actual yarn from her - it's SO beautiful though - even the samples make me smile! 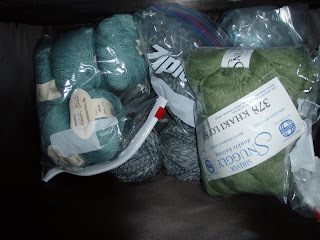 this is the big bin of green yarn that I had at one point planned to make a blanket out of... I have so many random collections of yarn.... it's scary. 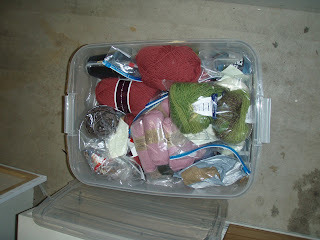 Take A Guess - How Much Yarn Does Kyle Have? How many balls of yarn do I have - put your guess in the comments - and the person who gets the closest to the actual number (or the number we arrive at after the re-organization effort) will win a fun (most likely yarn based) prize! I have tons of goodies to give out and love sending packages - I know having your number in the comments is not very "secret" and everyone else will be able to see, but since it's SOOOO random, (and since even I have no idea how much yarn I have) I think it's still fair! I should have the results next week. Good Luck! Ok so first let me say, I am very jealous! 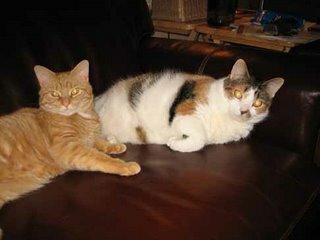 Second, you may have a problem. Third, I have to take a guess because I can't pass it up. I'm guessing somewhere close to 1475 balls or skeins or however you are counting them. This is a very scientific calculated.......Nope it's a stab in the dark. I'm SO jealous of your stash. Seriously, I think mine consist of about 15 balls! 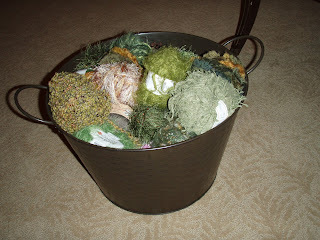 I think yours has 725 balls of yarn. 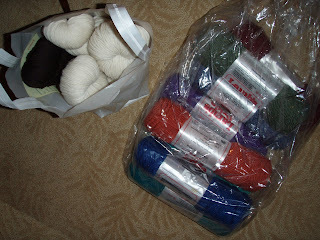 Holy crap, I have never seen so much yarn that wasn't in a yarn store! I'm going to guess 800 skeins. I am going for.... 1600. 'Cause I like 16. Found this post from Ravelry. I'll guess 1132, just because. yeah, ok, but OMG; that cute little dog! if that doggie is the prize, i'll take a wild stab at a guess 925! How about 842? No, 923. No, 1198. Yes, 1198 is my final answer. Probably light, but what the heck. You make me feel like I'm not trying very hard. Blessed be, that's a lot of yarn. I never know how to feel when seeing other people's collections. Jealousy is such an awful thing :) I'll settle for just being happy for you. Let's say 1316 skeins. I really kind of hope that guess is too high though! 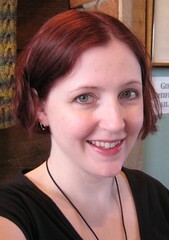 I'm AnnaEA from Ravelry. I am totally jealous of your stash - mine fits in two string bags. I guess you have approximately 850 skeins of yarn there. LOL! Mine is bigger and even less organized. I keep meaning to spend a day tidying it up.... Sigh. You should know that the yarn gets out in the night and frolics, and sometimes multiplies and certainly doesn't put itself back in any sort of tidy order. Guessing about the # of skeins, I'm going with 527. I realize that this is way lower than everyone else's guess, but then I've counted mine once or twice. Wow, I feel so much better about my assorted yarn piles now. Thank you thank you. I'm guessing 889.
good luck with the organizing. Iam guessing around 880 skeins! 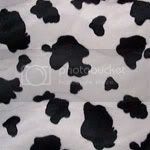 I hope this is the right anwer! I know there are other guesses near mine, but I'm sticking to 897. I'll say 575. I have no clue how much you have shoved into those drawers. and yes, you have a lot of yarn. 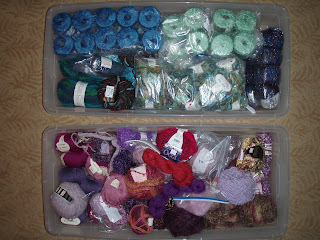 my stash is probably half the size of yours and before the summer began, i put myself on a yarn diet. that is no new yarn until i use up my stash...unless for a specific gift project that i need something that is not in my stash. 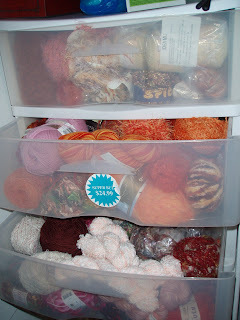 good luck with the organizing..hey now you will be able to post it all to ravelry!! 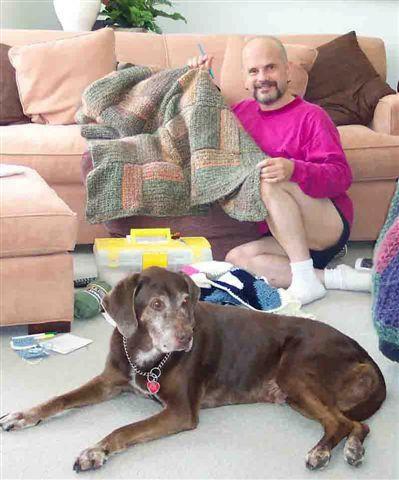 Another knitter here who found your blog from ravelry. I'm going to guess a nice even 500. That's some stash! I'd envy it, but I'd have nowhere to put it. Lucky you! I am going with 435! Very impressive stash! I'm going to guess 1375. 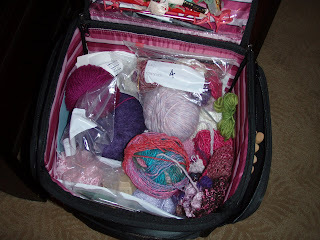 Saw your post on Ravelry (I am blackrayne there as well), and OMG that's a lovely collection! My guess is 742. Hope you'll post when you organize it. My guess is a bit on the short end, how about 205? and the eeg machine is an awesome find! I'd guess 974. Good luck with the organization! My guess is 674 skeins, another shot in the dark. What a fabulous looking stash! 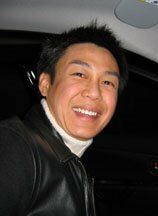 I am going to guess 918! OK, I'm guessing you have in the neighborhood of 2600 balls/hanks/skeins of yarn. That's just based on the pictures and the number of trash bags you said you have. I opened my store with 4400, and I probably have another 4000 at home in the personal stash so I'm not gonna judge you. 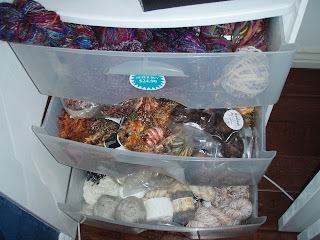 I'd suggest if you have a guest room in your house you should turn it into the yarn room like I did with mine. Just go to IKEA and get some of those big cube shelves then fill those suckers up. One of them will hold 1,000 balls of Plymouth Galway (for example) and even more of the things with smaller put-ups. You could also cover a wall in pegboard and hang hanks from that for a pretty "Wall of yarn" effect. 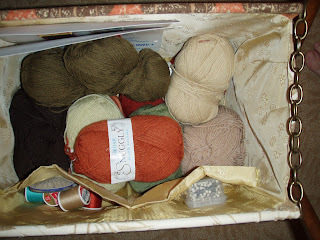 It could be like your own personal yarn store right there in your house! 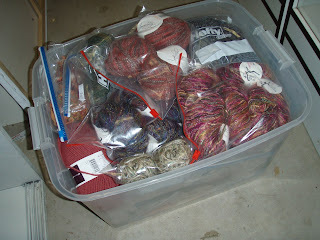 Lessee - we have over 100 pounds of yarn taking up a corner of our attic, and I thought that was a lot! Looks like you've got lots more than we do. I guess you've probably got close to 3,000 skeins. I think you may have a little too much if you can't remember where it all is! And I'll guess 1085 balls. If my anxiety caused me to break out in hives, I would've just broken out in hives. 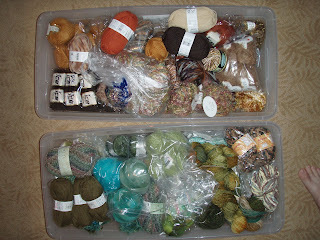 My comparatively miniscule stash (about 100 skeins) makes me anxious! You're braver than I am, that's for sure. My guess... 1147. Although, maybe I should say something like 10 just in case I win and you try to send me yarn! ;) Good luck with your re-organisation!